Join Le Cordon Bleu Australia Career Fair Day to meet and network with industry leaders. Open to all Le Cordon Bleu Australia students and alumni! Much of the job search process - before you can even get an interview - for both you, the job seeker, and for the employer in trying to find good candidates, is not done in person. It involves employers screening resumes and cover letters, and you reading about employers and viewing their websites, and the like. Take advantage of opportunities to meet employers face-to-face. Prepare a 20 to 30 second introduction to use with employers. You don't want to sound like a telephone solicitor reading a script; you do want to sound like you thought about why you're there. It might be something like, "Hello. I'm Ana Clarke, I’m studying the Bachelor of International Hotel Management degree. I'm looking for a placement in Food and Beverage. I read on your web site that (name of company) has a placement program in your F&B department, and I've done some previous F&B/other hospitality related work that I believe gave me skills that will assist me with undertaking a placement with your organisation. I'm very interested in your program." Get the idea? Keep in mind that some employer representatives may take control of the conversation quickly and you may do more listening than speaking, but you do want to be prepared to be proactive rather than passive. Be aware that most employers at Career Fairs do not want to be given copies of your resume. They will require you to apply directly to their website OR go through your Careers Services advisor, however, bring your resume and/or portfolio of work with you just in case someone does ask to see it. Always best to be prepared for any situation! Don’t ask "what does your company do?" This is a major annoyance to employers; you should know this in advance. What kind of person are you seeking for placement positons? What do you look for when considering students for placements within your organisation? What do you like about working for your organisation? Have an open mind. You may have a number of employers on your target list to speak with. If you have extra time, or have to wait to speak with an employer, take advantage of the opportunity to chat with other employers who aren't busy. You might learn something to your advantage or your surprise. At the least, you'll be practicing initiating a conversation in a less formal business environment - and this is an essential skill in any work environment. This is your opportunity to be evaluated on more than just your resume. In many aspects of the job search, your resume (and cover letter) is (are) all the employer sees to determine whether to interview you. At a fair, you have an opportunity to stand out in person in a way that you might not on your resume. Interpersonal skills, communication skills and work-place-appropriate social skills are critical. Many employers evaluate these skills heavily, because they want to hire people who can make a good impression on their clients and customers. Above all, be professional. 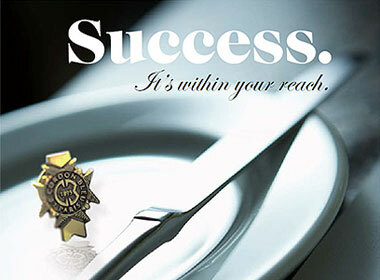 Remember you are representing yourself and Le Cordon Bleu.